So, You Want To Get Promoted. What Are You Doing About It? Doing your job is not enough. You were hired to do your job. The fact that you do it–even that you do it well–is not enough to make you stand out. If you don’t stand out, you don’t get promoted. This is a very important concept to “get.” What are you doing to stand out? When people across the organization (not just your unit) think of you, do they think you stand out? Do they think of you as a “go-to” person who “gets it done?” Do people outside your unit even think of you at all? There are different cultural expectations within organizations. “Follow the rules.” “Be a team player.” “Make your boss succeed.” “Get results.” What are the expectations in your organization? Are you meeting them? Are you exceeding them? To get promoted, you must exceed them. I actually don’t know an organization that doesn’t expect people–leaders–to get results. Do you get results? I’m not asking if you try hard. Or if you work hard. Or if you do what you are asked. Do you get results? Consistently? There are two sides to getting promoted. First, the need for someone to be in the position has to exist. Second, you have to be obviously the best choice to fill the position. The first isn’t under your control (although you should always be hyper-aware of these opportunities). The second is under your control. Sometimes you can see opportunities coming. Your boss is going to retire. There is a major reorganization happening soon. Someone is leaving. The company is growing. Sometimes you know what you want the next step to be. 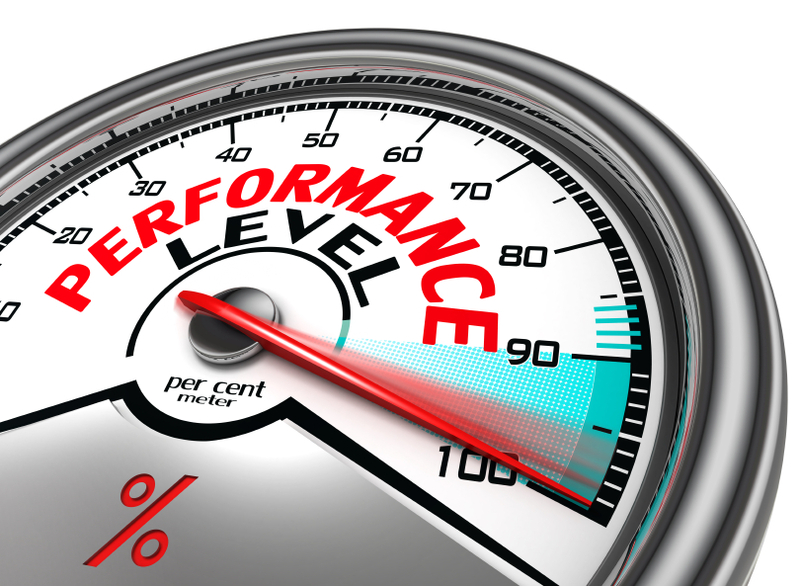 You may want to go to the next level in your organization. Or you may want to hop to another organization with a new kind of position. You should have A PLAN for whatever opportunity you see and want. What skills do you need to acquire. Are you being obvious in getting those skills? Are you seeking experiences that will grow those skills? Do others in the organization know that you’re growing the skills? It’s always important to remember that people don’t necessarily know that you are growing. Sorry. It isn’t obvious unless people are paying close attention. You need to make it obvious. How will you stand out so that people will immediately think of you when the opportunity opens? I used to sit in on conversations considering people to fill critical positions. It was unusual when everyone in the group all knew the same people. Most candidates had one advocate and maybe one other who had an opinion and the rest didn’t know the person. So . . . the candidate that everyone knew really stood out, especially if all the opinions were glowing. 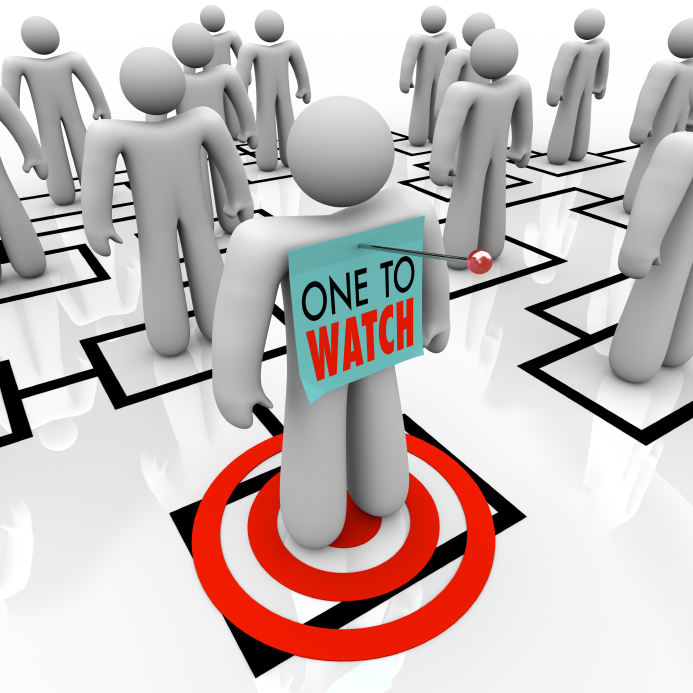 When you think about the potential next positions for you in your organization, think about who would participate in the decision. Do they know you? Do they think highly of you? What can you do about that? Look At Your Organization Through New Eyes. Every Day. Remember when you were new in your organization? Remember the things you noticed? Remember the things you thought? You noticed what worked and what didn’t seem to be working. You notice who had the power. You noticed who seemed to be moving up (and you probably had a clue as to why). You noticed who annoyed you and who you liked. Then you settled in. And you started to forget. You got used to things. You became friends with people. Your own prejudices and stereotypes kicked in and overrode your initial impressions. And you went on autopilot. So you are missing a lot of what is going on in the organization. You are missing the nuances and the undercurrents that can help prepare you for what is going on. Your “Spidey-sense” needs to be turned on at all times. Every time a new executive joins the organization. What ripples are caused when new people join the organization? We tend to assume that they will adjust to the organization (and to an extent they will), but the organization will change around them too. Think of new people as boulders in the white water. The water speed and directions/currents will change when the boulders are moved. Every time the organization is impacted in the market. If you’re not watching the “market” that includes your company, you’re driving down the street toward a dam that has opened up across the street. You will be overtaken by circumstances beyond your control. And you won’t be ready. Every time a new project starts or stops. People are impacted when projects start or stop. Opportunities open up. Companies downsize. This does not necessarily apply only to the people on the project. Sometimes those people are rewarded for the effort they have put into the success of the project—by being moved into your job or into your boss’ job. Every time cost cutting starts. When organizations are cutting costs, they re-look at EVERYTHING. They will at some point look at what value you are adding to the organization. Don’t assume that it is obvious. Use New Eyes to see what they see. In fact, do it before the cost cutting starts. Make sure you’re adding value and that the powers that be know that you are adding value. Don’t assume that it is obvious. Every time the organization gets stretched or starts to grow. Opportunities abound during stretch and growth times. Use NEW EYES to see where the opportunity is. Figure out how to be the one who others think of for those opportunities. Don’t just sit in your day job and let the growth happen around you—be ready and be available for it. When you get a new boss. This is possibly the most important time to be looking through your NEW EYES. Your boss doesn’t know what has gone before. S/he only knows what exists when s/he gets there. If there are problems in the organization, then it is likely that you are perceived (by someone who has just arrived) as part of that problem. Look for ways that you can help your new boss immediately. Look for what your boss wants to accomplish and figure out how to help him/her do it. QUICKLY. When you get new co-workers. Much the same things apply to new colleagues as new bosses. It is a great opportunity to see the organization through new perspectives. What is right and what is wrong about your organization. What can YOU do to help change things that need to be changed? How can you help your new colleagues be successful? When someone important gets fired. In fact when anyone gets fired. Firings should be wake-up calls for everyone. Why did s/he get fired? Did s/he run afoul of someone? Did s/he break a rule? An unwritten rule? Fail to get results? Look at yourself. With NEW EYES. 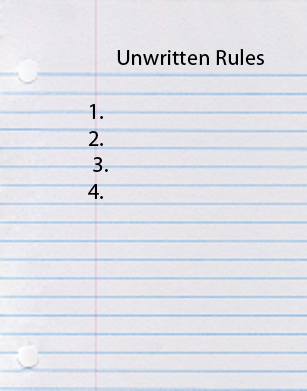 What The Heck Are Unwritten Rules? There are four problems to being able to understand the unwritten rules in your organizations. The first is that you believe you know the rules (these are your beliefs about how organizations are supposed to work) and that creates a blind spot for the unwritten (unspoken/invisible) rules that you don’t know. The second problem is that the unwritten rules keep changing. As new leaders come in, as the organization gets purchased or reorganized, the unwritten rules can change. The third problem is that the “unwritten rules” aren’t the same from organization to organization. So, when you change organizations (even subunits within your current organization), you need to reassess what the unwritten rules are. The fourth is probably the biggest problem. It is that the unwritten rules are communicated through informal networks, and if you’re not a member, it is hard for you to find out about them. They aren’t necessarily talked about, but people who are new learn to emulate the rules from the people in their networks. The unwritten rules are the “way things work” in the organization. People who know these rules aren’t necessarily able to articulate them, because it is likely that they “picked” them up without someone clearly telling them. These are things like how you’re supposed to dress, how you’re supposed to interact with others, how late you’re supposed to work, how and with whom you go to lunch, and a whole host of other things. You are evaluated by the organization by how well you follow these rules, even though no one has ever told you what they are. How Do You Figure Out the Unwritten Rules? Just because you don’t know them, it doesn’t mean there aren’t unwritten rules. The research shows that one of the best ways to learn them is to have a mentor who can help you. How? Find someone in your organization who you think knows what’s going on and ask him/her if s/he will be willing to be your mentor. Most people would be flattered by the request. Don’t get hurt feelings if the answer is no, go find someone else. Have a couple of conversations–over coffee is good–to see if the chemistry is right. Ask him/her about his/her career/success/path/learnings. People are almost always willing to talk about this. Listen to the stories looking for evidence of the unwritten rules. It’s ok to ask about the unwritten rules, but I wouldn’t do it in the first conversation. Start watching people closely. Especially the powerful and successful ones. Pretend you’re in a foreign country trying to figure out what’s going on. What do they do? How do they do it? How do the bosses react? Do you have the same reactions? If not, how are yours different? What are you missing? What values seem to be at play? Practice a little with your own behaviors. Flex your style a little. What reactions do you get? Ask people about how they think you fit in. Ask them about your behaviors against what they perceive as the unwritten rules. (It is highly likely that a peer would welcome this conversation because he would be interested in the same feedback.) Take the lists of “unwritten” rules above and ask for feedback. How did the responses fit with what you think? Did you cringe at anything above? At the rules as listed? At the thought of asking someone to be a mentor? At the thought of asking for feedback? At the thought that there are mysterious unwritten rules? If so, then chances are you need to think about it some more. That’s ok. Go ask some people you trust. See what they think.